A High Risk day in Central Oklahoma! Usually just the kind of setup that yields hordes of chasers and traffic jams on the Plains! We had spent the night in Oklahoma City, so we were in no particular hurry to go anywhere. There were two clear plays for the day: Play the outflow boundary up in Kansas, or the dry line in Oklahoma. We elected to go with the dry line play expecting more discrete supercells at the dry line than there would be in Kansas. After waiting around the hotel until about 11, we headed down I-40 west to Weatherford, watching as storms fired in Kansas but resisting the temptation to go charging north. Once in Weatherford, we stopped for lunch and waited some more, until about 3 o’clock when the dry line exploded with a line of supercells: a “string of pearls” as Roger likes to call it. We headed north out of town to intercept our target storm, getting up to the nice supercell between Thomas and Putnam. As we got to the storm, it was clearly not yet ready to do its thing yet, having a broad, flat base but not much of a wall cloud. We watched for a bit and then the cell started to get away from us and we headed northeast after it. Once we got to Eagle City the storm had matured and was now ready for business. We watched as it produced a brief multi-vortex tornado north of that town that quickly dissipated. We chased the storm north again and just as we got to Canton the storm produced for us a whole menu of tornado types. First, a beautifully backlit Wizard of Oz-like tornado, which then grew into a big stove pipe as it passed to the north of the town, then an even bigger cone, then wedged out as it headed off to the northeast, all tremendously photogenic. We were able to get through town quickly and got on a northeast road that let us drive more or less right alongside the now huge but mostly rain-wrapped wedge. We chased it past Longdale and all the way to near Fairview before it finally roped out, but as it did, the meso jumped and a white elephant trunk formed on the right side of the road in front of us while the original tornado died on the left side. We headed north then east out of Fairview, where the storm produced a long ropey tornado north of us near Isabella, the 4th tornado of the storm. Once that tornado finally died, we drove alongside the white-lit updraft, a fantastic corkscrew that I was able to get a couple of nice shots of even though I was driving. The storm finally weakened and was getting away from us, but it was only 5 PM, so there was plenty of chase time left! The next two storms to our south were both producing big, dangerous tornadoes, one of which was to pass through Piedmont on the northwest side of OKC and the other through Norman on the south side. We decided to try and intercept the Norman storm but to do so we needed to get around the northern storm and in front of the southern one: A trek of about 150 miles! We blasted east out of O’Keene all the way to Stillwater, just as the northern storm was about to hit Guthrie not far to our southwest. We then turned south and plunged towards the interstate, then passed it and went all the way to Tecumseh in order to be sure that we were clear of the big hook that had been housing a large tornado for hours. We charged back north of the interstate and there it was backlit in orange, a large stovepipe to our northwest. We headed west towards McLoud and as we popped out of the trees, the tornado was just to our south-southwest roping out! As the tornado disappeared, it quickly became clear that the rotation was going to pass almost right over us, so we rushed back east and then south, and as the meso passed directly above us several people in the van complained of popping ears and you could actually smell the remnants of the long-track tornado: a burning, moldy, “funky” smell. We hopped on I-40 and headed east, trying to stay in front of the next storm in the line and ended up in a big rain core, finally getting off in Cromwell and heading north. We headed north of the interstate and got under the ugly black base of the storm, but it didn’t look like it was going to do much. Then we got into one of those situations where every time we wanted to give up on the storm it showed a little more. We chased the storm northeast for about an hour through winding, wooded roads, around Lake Okmulgee and into the city of Okmulgee itself. The storm was now far out of reach to the north, but we were fairly certain we observed a couple of power flashes, which seemed to be confirmed by later spotter reports as a tornado. After dinner, we headed for the hotel in Ft. Smith, AR, but the day was still not over. By now, there was a raging squall line in front of us and several very nasty looking tornado warned supercells to the south that were going to arrive in Ft. Smith about the same time as us! The closest of the supercells had about the nastiest looking radar return I can remember. As we plowed through the squall line seemingly forever, several of the guests, clearly still a little spooked about Joplin 2 days earlier, were seeing lowerings in the lightning flashes and worrying that there was a tornado but they were generally just seeing cloud debris around the shelf cloud in front of us. We beat the storms to Ft. Smith by only minutes, and were still unloading the vans when the tornado sirens started sounding, frightening the other guests at the hotel. I planned to get up to my room, setup the radar on my laptop, then go down and watch the show, but the storm was moving even quicker than we thought! The first gusts from the violent bow echo hit as I was coming down the stairs, knocking big limbs off of several of the trees near the hotel, including one that landed on a truck parked right in front of the lobby. Then, boom, boom, BOOM! Three transformer explosions and the power was out…. and stayed out the rest of the night, meaning that there was no breakfast or coffee in the morning, cold showers only, and with nobody getting any sleep in the warm, muggy rooms with no AC, we had a bunch of grumpy guests and drivers the next morning. 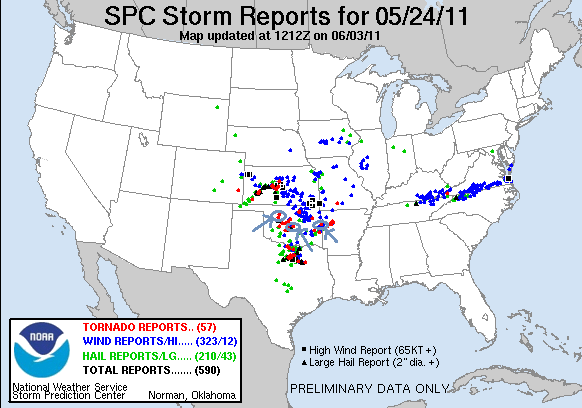 Still, we were lucky we got hit by the nose of the bow echo and that it had kept the tornadic supercell to our south, as it produced a deadly tornado that killed 4, injured 18, and leveled the town of Denning one county east of us. So, another wild chase day that wasn’t over until well after we thought it was! The tornado count for the day was five as we can’t count the power flashes off to the north of Okmulgee. One benefit to chasing the supercell away from OKC was that chaser convergence really wasn’t that bad. The mileage actually wasn’t that high for the day, 535 miles but it sure seemed like a LONG day driving the lead van to me! A "High Risk" issued for Central Oklahoma by the Storm Prediction Center had the hotel on alert as we awoke in the morning virtually in our target area for the day already. Here, there broad base of our target storm early in it's life cycle near Oakwood, OK. Later, south of Eagle City, the storm started showing rotation and developed a wall cloud. Now just north of Eagle City, a brief multi-vortex tornado forms in the rain, then quickly dissipates. It wasn't quite ready yet! ... Until the storm got just north of Canton, OK. A new tornado forms just outside of town. Suction vortices dance under the funnel cloud as the tornado gets going. The motion was awesome! Beautiful Wizard of Oz tornado, with a fantastic Merry-go-Round meso above! Broader look at the mesocyclone, wall cloud, and tornado. Tornado growing larger very quickly. Debris fan starting to form at the base of the tornado. Tornado churning up the fields north of town. Tornado continues to grow. The tornado grows into a wedge. This is my postcard shot: Welcome to Canton, don't mind the tornado! Wider view of the storm as it really wedges out. Ominous! Now a big wedge, there were actually 3 storms in a line from this one down to Chickasha producing big damaging tornadoes at the same time! Tornado growing HUGE!! We chase it north of town. Here's the tornado just to our north-northwest, wrapped in rain as we drive along side it along route 58. We couldn't see it from where we were, but the tornado was actually going across Canton Lake at this time. Same shot with the contrast adjusted to bring out the tornado. As we neared Longdale and the first tornado was dying to the northwest, another tornado formed to the northeast. Same shot with the contrast adjusted to bring out the tornado. ..and here is the first tornado dissipating. Still a decent sized cone in there... Finally as we get near Fairview, the storm produces a long, ropey tornado. Hard to take a good shot while I was driving! As we passed the storm to the south, the sun illuminated the updraft just right. Magnificent corkscrew!